Up for a sale is a rare military radio from the Vietnam war era. Model: RT-841 (AN/PRC-77) Receiver Transmitter Military Radio. 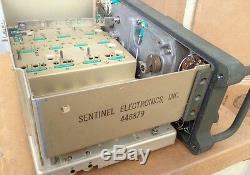 Condition: Unused, but unit was cannibalized , so it is missing some modules and upper cover missing as well, so unit does not operate. Cosmetic condition is very good (Same as in the picture), can be used for collectors and museums. I do not provide any additional accessories with this unit. The item "PRC 77 / RT-841 AN/PRC-77 Vietnam War Portable Military VHF FM Radio US ARMY" is in sale since Monday, November 3, 2014. This item is in the category "Collectibles\Militaria\Surplus\Radios". The seller is "rm15483" and is located in Tel-Aviv. This item can be shipped worldwide.